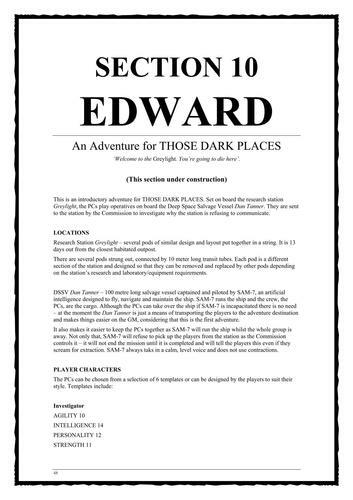 Has it really been almost 9 years since I created the 'Those Dark Places' RPG playtest document? There are times when I find certain design documents and I think that it's something I put on hold for a short while, but then I see the date on it and I'm shocked by how much time has actually passed. The ODDS System back then was still a single die, a D20, but it was a little flat and stretched out as I tried to drag as much as I could out of it to make it a fully-fledged and detailed game. The document went out and I had a little feedback on it, but it never really amounted to much and my feeling was that there was no need for another RPG on the market. 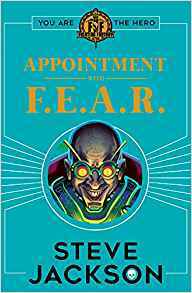 I also thought that my chosen genre - the dark sci-fi of the 1970s and 1980s such as Alien and Outland - was, perhaps, a little too niche and the dark, grimy and industrial future was a stark contrast to the bright and shiny i-future we were actually in. I didn't think people would go for it. But, as the computer game ALIEN: Isolation proved to me, that wasn't the case. It could work, and that genre had an audience. Now that I've created a new version of the system, and it's a lot simpler and allows for much more freeform gaming, there's a whole lot more I can do with it. 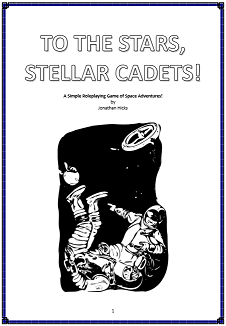 The new version of ODDS as featured in 'To The Stars, Stellar Cadets!' 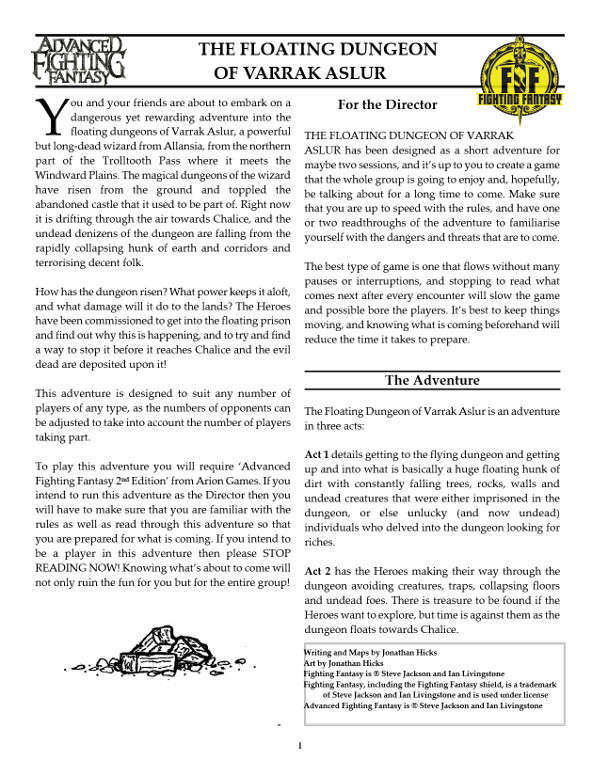 (see the free download image in the right-hand column) is quick and simple, and the extra rules in the free adventures add options for much more action-orientated games. It was designed specifically for pulp adventures. My next project for ODDS is a game light years away from that golden age of derring-do. 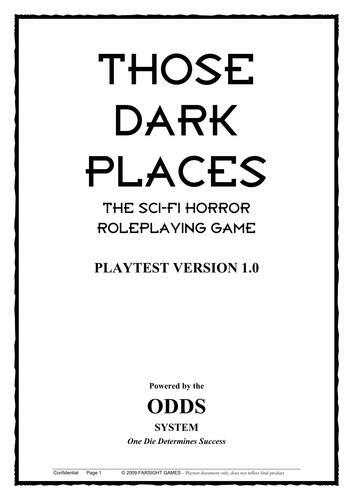 I think 'Those Dark Places' is a good enough title for it and it'd be interesting to try and incorporate some of the themes I was trying to emulate in the original game. I'll have to create art for it, though, and spend more time in laying it out so this will be a totally different beast to my free game. With the release of another six Fighting Fantasy gamebooks coming up - including the new title 'The Gates of Death' by Charlie Higson - it's a great time to be a Fighting Fantasy fan. 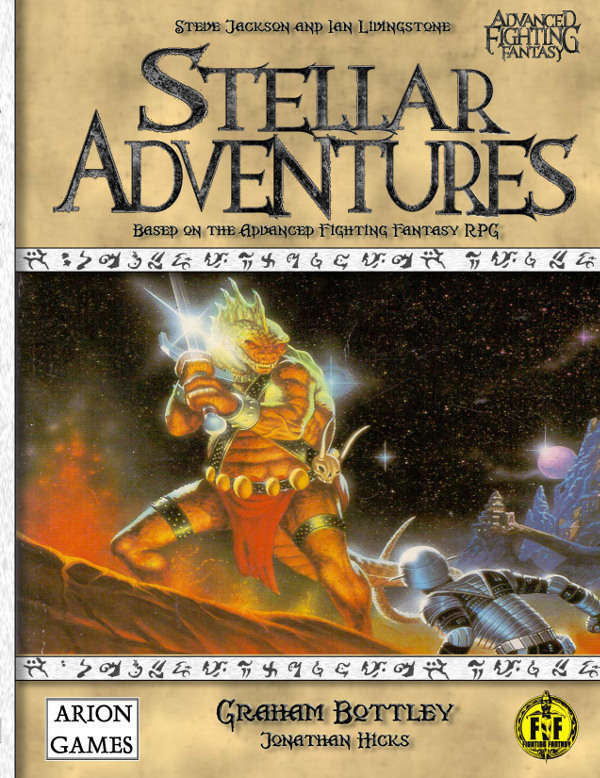 I'm writing adventures for the Advanced Fighting Fantasy roleplaying game but it was the original gamebooks that got me my start in the tabletop hobby. I've told this story before, but I thought I'd share it again. 'It's 1983. My little sister is still at primary school and I've not long started secondary school. She comes home one night with a small pamphlet filled with small images of children's books; the Puffin Book Club, made available to schools. She wants to know if anyone wants anything as she is going to purchase a book or two. 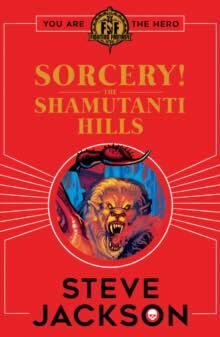 So, I'm scouring these book images for anything that seems even slightly quirky when my roving eyes fall on the image of some kind of cat/wolf beast with black fur and red eyes, at the head of a long line of beasts all exiting a castle as bat-winged creatures soar through a blood-red sky. 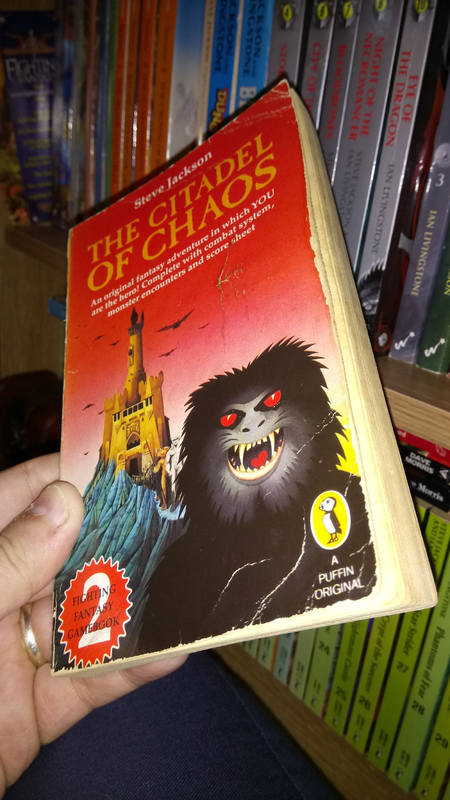 It's 'The Citadel of Chaos', book two of the Fighting Fantasy series, and I'm intrigued. 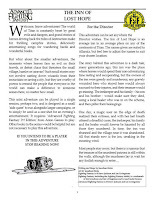 An original fighting fantasy adventure in which YOU are the hero? Whatever could this mean? So, bang goes a week's pocket money and the book is ordered. Several days later, I sit down on a rainy Saturday afternoon to read it and I'm perplexed by these scores, dice and apparent rules. After raiding the tattered Monopoly box for two six-sided dice I tentatively have a first go at the book. And that was that - my long-term love affair with Fighting Fantasy had begun. Over the years the gamebooks gave me a slice of everything - fantasy, science fiction, superheroes, post apocalypse - but it was always the world of Titan, and in particular the continent of Allansia, that I enjoyed the most. The world is rich, imaginative and quite insane. For every standard fantasy trope there's something much more incredible, with locations and adventures that really bring the world to life. When I was a kid I always imagined that each adventure book was the continuing adventures of my own character in the world, so I created a character that I would use over and over again as each new book came out. His name was Bilks Magra, and with SKILL 10, STAMINA 18 and LUCK 10 he wasn't a bad adventurer although he met his doom quite a few times, but with the spell FIP (Finger In Page) and a fudged roll or two he was quite the hero. I didn't complete all the books but it was all about the experience for me. Of course, I grew up. My Fighting Fantasy books stayed with me and the collection slowed to a halt in the early 1990s. Over the years I picked up the odd book, and I bought some of the re-releases from Wizard, and now I'm buying them all again from Scholastic for both my collection and my son. Even at the ripe old age of forty(harrrummpph) I enjoy the books even though they were written for children, and the world is still vibrant and a lot of fun. the Sorcery! series showed me that there could be a more involved side to the games, and the RPG has allowed me to flex my own creativity both as a GM and as a writer and artist. No doubt I changed my views and opinions of the world to suit my perceptions and attitudes as I get older, regarding it as somehow a bit more grown up than it appeared to be; indeed, the world is filled with horrors and dangers, and more than once a gruesome death against a fearsome creature from the Pit made it feel a lot more grown-up and mature, but that just tells me that it's a book that can be enjoyed by all ages. So here we are again, 36 years later, with the books being re-released and a whole new book on the horizon. 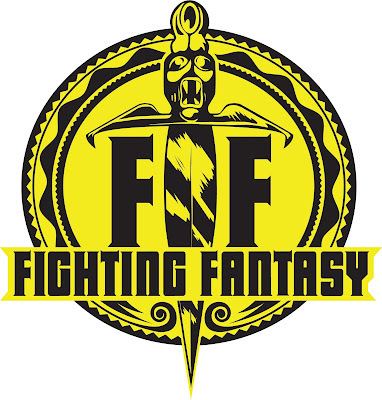 Fighting Fantasy is in books, computer games, audio dramas, comics and RPGs. The name is still out there. I'm sure there are other mediums it can cover - the board game market is especially huge at the moment and a new and innovative Fighting Fantasy game would do well - and I'd love to see more novels based on Titan with new characters and adventures, but I'll always rely on my gamebooks to give me that thrill and I hope kids of all ages get the same amount of fun and inspiration from them as I did. New Fighting Fantasy book covers? Well, this took me a bit by surprise. I was browsing Amazon looking for a Japanese language copy of Temple of Terror that I saw on there the other day - as you do - and suddenly these covers jumped out at me from the search page. Are these the finished covers or the holding images? I have no idea. It's quite a leap from the colourful six books that came out last year. I checked out Scholastic's website and I can't see anything on there about them. They've got this 1930s art deco thing going on and... well, I kind of like them. What do you think? Shades of Vengeance is a roleplaying games company that has already given us the ERA games, such as the sci-fi Era: The Consortium and the post apocalyptic Era: Survival. 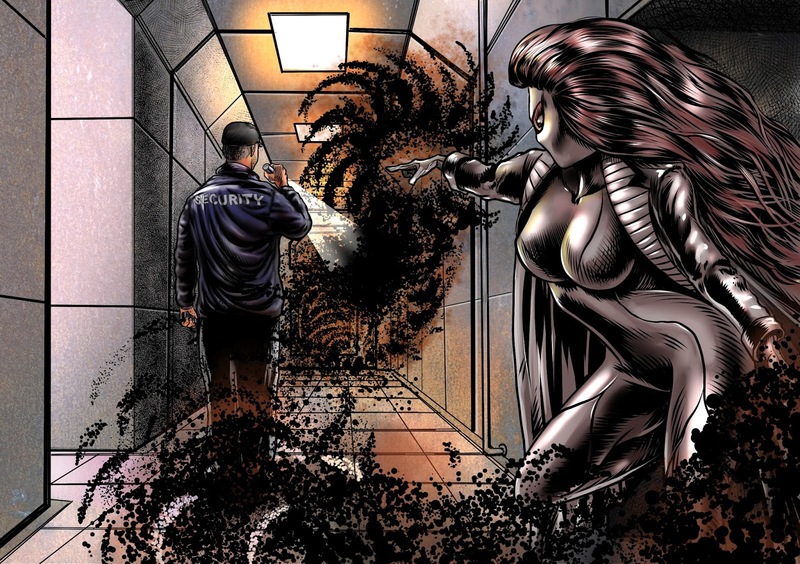 Their newest game is Era: The Empowered, a game of superheroes and the world they inhabit, and - as of this blog post - it's running on Kickstarter now. I had a chat with Ed Jowett of Shades of Vengeance about the new game. Welcome to Farsight Blogger, Ed! Tell us something about your gaming history; how did you get into the hobby, and how did you get into the business side of things? I had played before, but I really got into the hobby when I went to university! I joined the indoor gaming society and quickly became one of the regular GMs in the mix. I ran a lot of Paranoia in those days, along with various other things, from Firefly to World of Darkness. There's a tradition at Durham University in the society that we run a 24-hour game each year. 6 GMs create a setting and world, along with a campaign to explore it. The previous year had been fantasy so it was decided to be Sci-Fi. I worked very hard on that setting, creating two types of alien race, complete with weaknesses, and fleshing out the majority of the setting from the concept of "Firefly", which was where it started. The game went very well, and I stopped playing for several years after that, because I started working. About a year later, I was really missing it, so I got a group of friends and family together and revisited that campaign. It went extraordinarily well, and my brother asked me to write down the rules so he could run the next campaign. That really kicked things off, because I spoke with a friend in Canada about it, showed him what I'd written, and he convinced me to publish it. The rest is history: I've now published 7 RPG game lines (several of which has expansions), comics, card games and more - 38 products in total, so far! 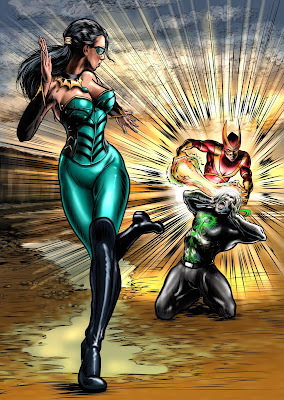 Your newest project is Era: The Empowered, a superhero roleplaying game. Tell us more about the game and the setting. Era: The Empowered is a special kind of superhero game. It's based around a timeline which contains the various stages of a superhero world - from being the very first superheroes the world has seen to forming groups like the Avengers, to recruiting sidekicks and a more "Young Justice" feel, to facing extra-terrestrial threats on a scale unimagined by even the most pessimistic individual. You can encounter the troops of Atlantis, face down the Assassins Guild, or anything else you're used to in terms of the stories which we're able to experience through movies, tv series and animated styles in recent years. In this game, you choose the time period you want to play in, meaning it's every kind of superhero game in one - you don't need to homebrew settings to play something else. The game itself is based on our critically acclaimed Era d10 Rule Set with some special modifications to allow for superpowers. You can build any superpower you like in this system, using our "power tree" method, and ensure that everyone is balanced. You can also, if you want to add more powers, give your character a second or third power tree! How did this come about, and what was the attraction to the superhero genre? I've loved the superhero genre for years, but I've also been working with Johnathan Lewis since I started creating games. 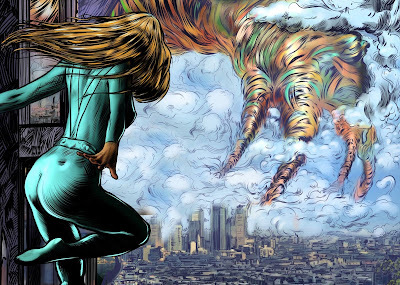 He's worked in the comic industry for some time and Era: The Empowered was actually the game I had planned for development second, once Era: The Consortium was complete. We worked together on the storyline, him from the storytelling perspective and me from the universe creation angle. 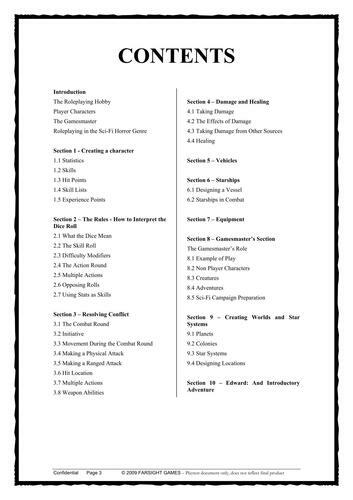 Back then, I did create the Rulebook Primer, which offered the rules but no equipment. Although I had the mechanics sorted out in my mind, I felt I needed to playtest creation a lot more. Other projects got in the way sometimes, but I never stopped working on Era: The Empowered. The Marvel Cinematic Universe has been a big inspiration to me on this project - it's the kind of storytelling I aspire to! I'm happy to have finally got to the point where completing the Core Rulebook is in sight, although there's much more to come! What makes this superhero game different from the others available? As I explained earlier, the timeline approach to the history allows people to play any kind of superhero game they like. Most games give you a specific scenario - you're the first hero, or you're the third generation of heroes in a world which has become used to them. This game doesn't: it gives you the chance to play any or all of these types of setting, by following with a timeline from the moment of emergence to the point where the world looks like it's about to end. The story actually goes on beyond that, into parallel universes, but that's a tale for another book...! You've also got fully illustrated comics available. How do these tie into the game? The comics describe adventures of some of the major characters in the Empowered universe. Lacuna and Penumbra have both had this treatment, and Blue-Shift is on Kickstarter now! We've chosen these characters because they are the ones we offer for play in the example sessions we run, as well as being major figures in the general storyline. In short, they expand the universe further through a medium which suits superheroes nicely! How will the game be supported in the future? Can we expect to see sourcebooks, adventures and campaigns? Absolutely! In fact, we've already been supporting it with sessions on our Patreon. As I indicated earlier, the Core Rulebook provides a timeline, but it doesn't finish the story entirely. In the best comic traditions, there is an ending, but things may happen beyond that! I've also set up the first Source Book as a stretch goal - Golden Age Heroes! The slightly cheesy feel from the 60's with colourful characters and terrible puns will be upon us if we reach that! Dice and Stuff are also supporting us with another entry in the Cowl Cops series. The first 5 podcast episodes are here. What else do you have in the works? What else can we expect to see from Shades of Vengeance? I have loads more in development, as always. You can expect to see our first licensed property this year - the Battlecruiser Alamo series of books by Richard Tongue is being brought to life through the Era d10 Rule Set. We're also working on several more large games, not least Era: The Chosen, our latest entry for the era universe, which we expect to release in October! It's a busy time for us, but we're rising to the challenge as we find more and more people who are interested in our work. I can't say how inspiring it is! That awkward moment when you realise that the new guy you invited to the game isn’t a nice bloke at all. In fact, he’s a nasty piece of work. The game started to go wrong very, very quickly. This new player – I’ll call him Roger – didn’t seem to care about what other people thought of him. This first became apparent with his foul mouth, eating habits and uncomfortable sense of humour. I’ve talked before about how certain jokes at the table make me feel uncomfortable, and this guy had an entire plethora of bad, inappropriate jokes to share, primarily of a sexual nature. In the game he was even worse. First and foremost he was rude. A comment he made that sticks in my head was, ‘If you do that then you’re a f***ing idiot’, in response to another player’s idea. ‘Is your PC saying that?’ I asked. ‘No’, he said, ‘I’m saying that.’ And it was pretty much downhill from there. These days I screen potential new gamers for two reasons; One, to avoid this kind of thing ever again and two, it’s nice to meet people outside the game first so that you can get to know them as non-gamers. It’s a simple meetup at a pub or cafe, a few drinks and a chat and we can get to know each other as a gaming group before we get into the game proper. I’m not being rude meeting up with people like this, I think it’s only fair, to them and to me. What if they don’t like the way I or my group do things? It’s an opportunity to find out if you all click without going through the trauma of being involved with a disastrous game and is the best thing for everyone. '6 for 20' - This phrase is personal to me as I use it to refer to games that, as far as I’m concerned, completely waste my time. If I feel that I’ve wasted my effort in preparation or playing I’ll call the event a ‘6 for 20’. The phrase came about after being asked to take part in a Rolemaster game. I’d had some experience with MERP so I was interested, but the GM running the game went over every single tiny detail of character creation. In the end, my PC took 6 hours to create. Yes, you read that right - 6 hours. Once the game started, two weeks later, my PC was killed in the first 20 minutes of the game by being backstabbed by the GMs NPC assassin, the very first roll of the game. One lucky critical roll and I’m dead. 6 hours of work for 20 minutes of gameplay. As it turned out I had a lucky escape as the rest of the game turned out to be a railroad nightmare, so when asked to create another PC for the next game I politely declined. Cubicle 7 are still working on the new edition of Warhammer Fantasy Roleplay - which I'm super excited about, of course, as it's my favourite roleplaying game ever and I can't wait to see what they do with it - so in the meantime they're releasing PDFs of the original Warhammer FRP campaigns for the first edition of the game. As with the other releases, The Enemy Within Campaign: Power Behind the Throne isn't just a starightforward scan and publish. They've carefully scanned every page to create a PDF that maintains the appearance of the original, as well as being bookmarked for ease of reference. It's an amazing adventure and I can't wait to get my teeth into it. Again. It's been a stellar few years for Free League Publishing - Fria Ligan in Swedish - and I caught up with CEO Tomas Härenstam to find out more. 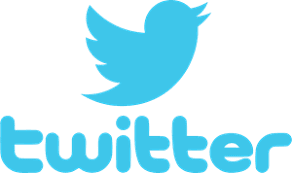 Hello Tomas, and welcome to Farsight Blogger! I always ask this of all my interviewees; what got you involved in the wonderful world of tabletop roleplaying games? I got my first RPG - the Swedish "Mutant" - as a birthday gift from my dad in 1985 when I turned 11. I think neither he nor I had any idea what it was. I sometimes wonder what he would think today about the fact that RPGs are now a major part of my life, 33 years later! With all the games on the market, what do you yourself enjoy playing the most? There’s a lot going on with Free League Publishing at the moment, so do you even get time to play? It's hard to find the time, but I really feel it's important to play RPGs, and not only playtesting our own games. I have played a lot of indie games in the last few years, but right now I'm starting up a campaign in 1st Edition Twilight: 2000. Free League Publishing has made a huge impact on the roleplaying game scene this last few years; did you see this popularity coming when you started in the business, or did it come as something of a surprise? Well yes, it has been a very welcome surprise! Of course we knew that we were making high-quality games, but we had no idea beforehand what kind of impact we would make on the international market. It's been amazing! 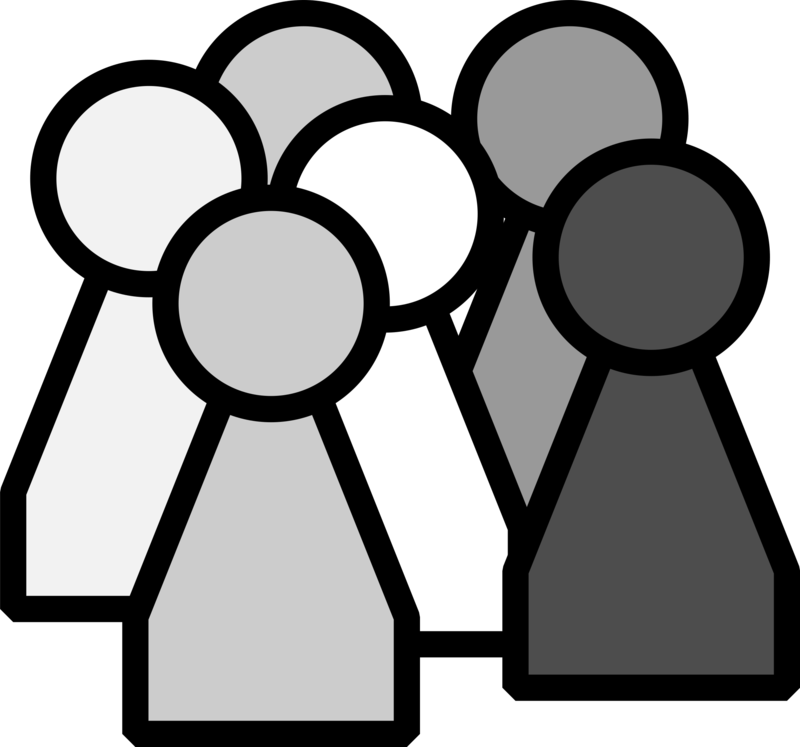 You’ve got some excellent award-winning games out, and they’re all different genres and styles. Tales of the Loop stormed the 2017 ENnies, Mutant: Year Zero enjoyed its own list of achievements and Coriolis – The Third Horizon has received some excellent reviews. Do you intend to release further support material for these games, such as campaigns and adventures? What do you have in the works for your existing products? Mutant: Year Zero: The robot expansion Mechatron is next up, it will been sent to print in a few weeks and released in the spring. Coriolis: The epic Emissary Lost campaign moduel will be released in the summer. Flood artbook. It expands the game into the 1990s and lets you play a little older characters in the upper teens rather than the lower teens. The movie-like trailers you produced for Mutant: Year Zero are outstanding. How did these come about and what was involved in getting them made? Will we see any more for the other products? The particular trailer you mention was a cooperation between us and a team of animators we know. We generally can't afford to make trailers like that, but have had some great trailers later as well I think, among the Kickstarter video for Forbidden Lands and The Electric State artbook. Your newest game is Forbidden Lands, and it’s already had an incredibly successful run on Kickstarter. What is the game about? Forbidden Lands is a new take on classic fantasy roleplaying. 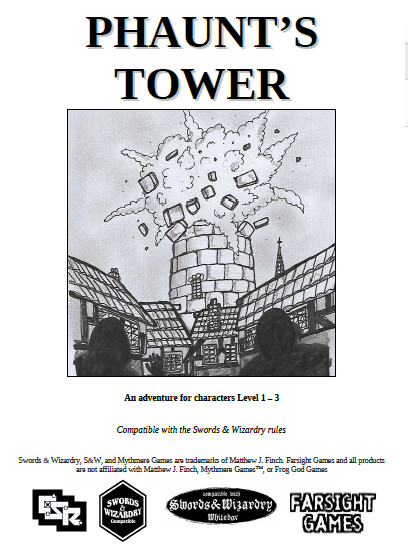 It is an open-world survival tabletop RPG where the player characters are not heroes sent on missions dictated by others - instead, they are raiders and rogues bent on making their own mark on a cursed world. They will discover lost tombs, fight terrible monsters, wander the wild lands and, if they live long enough, build their own stronghold to defend. There’s a lot of fantasy RPGs out there, so what do you think Forbidden Lands will bring to the table? What makes it different? I think it's the perfect blend between old school and new school fantasy gaming. It's truly built to let the players explore the world the way they like, while still offering an epic, overarching campaign experience. This modular approach to campaign play is unique and very much a Free League trademark. And the art and graphic design is awesome! You’re using the same rules from Mutant: Year Zero and Tales from the Loop. What changes and additions have you had to make to the mechanics make it work for Forbidden Lands? 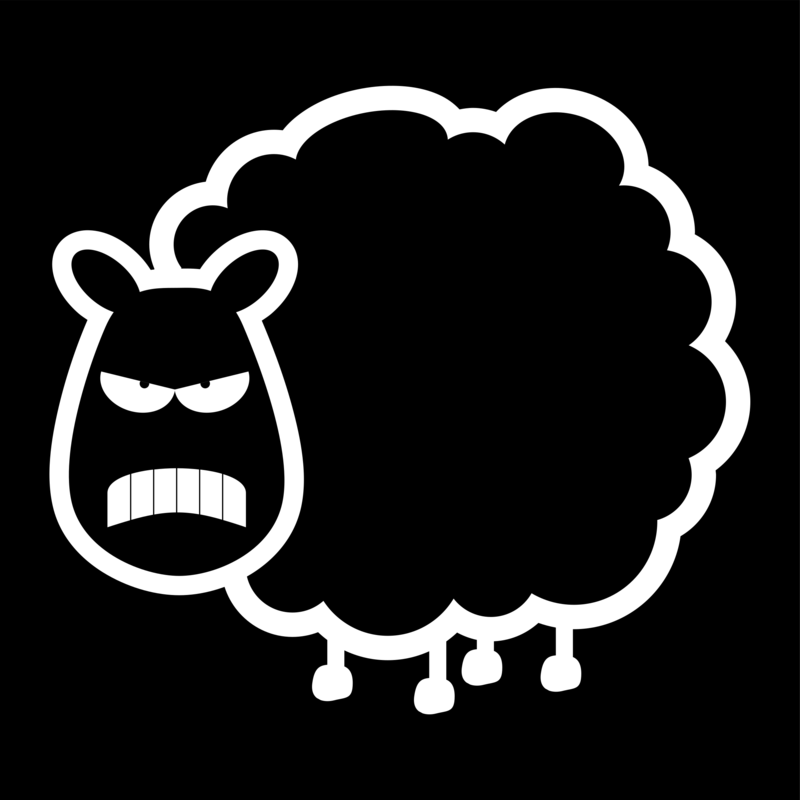 There is an Alpha of the game recently released to all backers, including almost the complete rules. Talents are now tiered, allowing greater customization and improvement options. The system for melee combat has been expanded, making swordplay a core feature of the game. 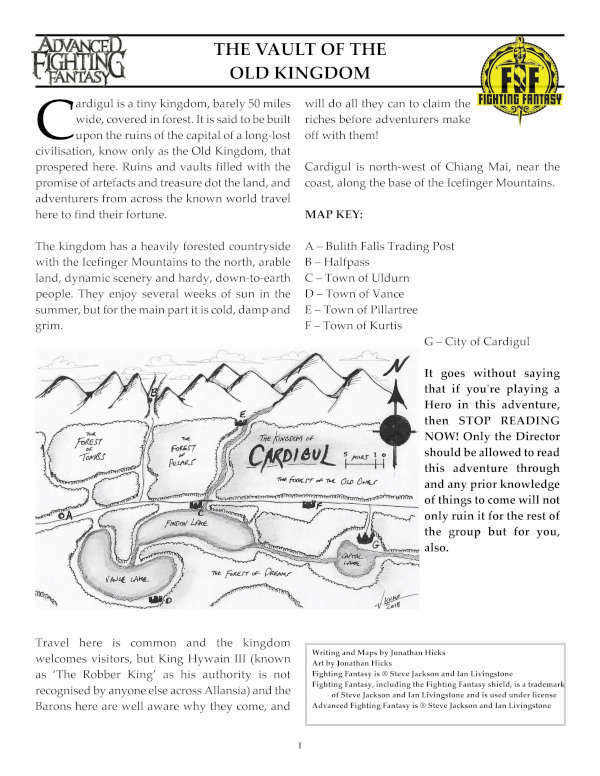 The system for exploring the map is based on Mutant: Year Zero, but it is developed further and has rules for pathfinding, making, camp, hunting, foraging, etc. There is a system for random encounter where each encounter is a mini-scenario, not just “D6 orcs”. There’s a system for building your own stronghold, a little similar to the Ark in Mutant: Year Zero but different in several aspects. What kind of support can the game expect after publication? What kind of books do you plan to release to help the game along? There will be a big campaign book, called Raven's Purge, released alongside the main game, and after that, we are planning a range of expansions, each expanding the game map in a particular direction with a complete new map to place alongside the original. To the north, there will be an arctic landscape, to the east, there is a huge archipelago, etc. Each expansion will include a complete campaign. What else can we expect to see from Free League Publishing in the future? Lots of cool stuff! Some things we need to keep under wraps for a while longer, but stay tuned! It's been a while since I last spoke to author Jonathan Green, and back then we were anticipating the release of 'You Are The Hero', the first volume of his history of Fighting Fantasy. Since then he's written a sequel to the book and released other things besides so I thought it'd be nice to catch up Jonathan to see what else he has in store, and to find out more about his upcoming gamebook 'Neverland - Here Be Monsters!'. Hello again, Jonathan! 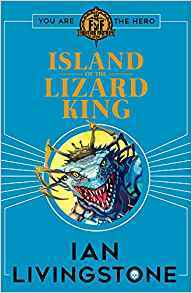 It’s been a busy few years for you; the ‘You Are The Hero’ books, ‘Alice's Nightmare in Wonderland’, ‘The Wicked Wizard of Oz’, and now ‘Neverland - Here Be Monsters!’, coupled with Fighting Fantasy Fest 2 and all other manner of stories and work. How on earth do you juggle it all? With great difficulty! I also have a conventional part-time job and children to get to school, or Guides, or wherever. I always have four or five projects on the go at once, with usually one that demands most of my time at any one time. I write in the morning, go to work in the afternoon, and then write in the evenings, at weekends and during school holidays too! About ‘Neverland - Here Be Monsters!’. What made you want to twist the original J. M. Barrie stories into this mash-up with monsters and pirates and dinosaurs? I’m not sure really, but it was an idea that had been percolating for a while. I had wanted to write a gamebook in which Blackbeard the pirate went to Skull Island (as seen in Peter Jackson’s ‘King Kong’), but when I started writing the ACE Gamebook series it seemed like a good idea to transfer the adventure to Neverland and make the pirate Captain Hook. I’ve never been a fan of Peter Pan, but everything’s better with dinosaurs… right? What can we expect to see in the pages of the book? What can you share regarding the plot and the system you’re going to use? With each ACE Gamebook I’ve always made some advancements. ‘Alice’s Nightmare in Wonderland’ introduced the ACE ruleset, ‘The Wicked Wizard of Oz’ introduced the RPG element of playing as different characters, and ‘NEVERLAND – Here Be Monsters!’ will add steeds to the mix. The adventure follows the basic plot of ‘Peter Pan and Wendy’ but with elements of ‘The Lost World’ thrown in. You seem to enjoy playing with the classics, as seen with ‘Neverland’ and the previous books ‘Alice's Nightmare in Wonderland’ and ‘The Wicked Wizard of Oz’. Do you have your sights set on any other properties? Fighting Fantasy Fest 2 was a huge success. What did you do differently with the second convention, and are there plans for another one? I asked for feedback from guests and attendees of the first one. People seemed to like pretty much everything about the con itself, but they said that the venue was too small, there wasn’t enough time to game, and food with either too expensive or almost non-existent. So, we moved to a larger venue, there was much greater variety of food at an affordable price, and the day itself was much longer. We even had a pub quiz the night before to raise money for Prostate Cancer UK, in memory of ‘Freeway Fighter’ illustrator Kevin Bulmer. I would like to organise another event to mark the 40th anniversary in 2022, but I think we could also fit another in before then. 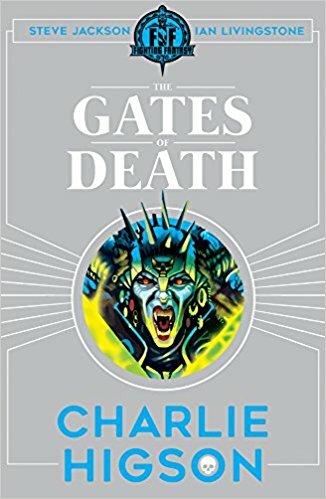 It just depends on us having something new to bring to the event, but by then Charlie Higson’s ‘The Gates of Death’ will have been published. What was your personal favourite part of Fighting Fantasy Fest 2? You released ‘You Are The Hero Part 2’ at the convention. 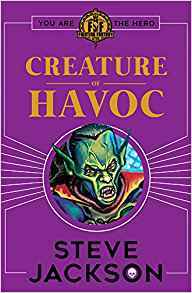 The first book was an excellent view on the history, world and fandom of Fighting Fantasy, so what did you include that was new for this volume? Since Part 1 was published, I had managed to track down more of the creators, or they had been in touch with me, so I could interview them. There had also been developments with the ‘Freeway Fighter’ comic, ‘The Trolltooth Wars’ graphic novel, and Scholastic publishing the series for a new generation with a new title – ‘The Port of Peril’ – by Ian Livingstone. I was also able to expand on what the fans had been doing in the interim. Is there enough material for a third instalment? I expect there will be, I have some notes made already, but I’m also wondering about re-editing and revising Parts 1 and 2 into one volume, with new material included. I’m also keen to write a history of non-Fighting Fantasy gamebooks and have an outline already prepared. Now that Scholastic are printing old and new Fighting Fantasy gamebooks, do you have any plans to pen another adventure for the series? It all depends on whether they ask me to or not. I have one idea in particular that I’m keen to explore. What else are you working on at the moment? What can we expect to see from the mind of Jonathan Green in the future? At the moment I’m working on ‘NEVERLAND – Here Be Monsters!’, but I’m also writing more Scrooge and Marley (Deceased) stories – the first one, ‘The Haunted Man’, came out in time for Christmas – and I’m planning my next Kickstarter. I just don’t know yet whether it’s going to be for a new horror anthology or a card game. I'm really happy to announce that my first official Advanced Fighting Fantasy adventure 'The Floating Dungeon of Varrak Aslur' is now available! 'The town of Chalice is in danger from a very unexpected source: A Floating Dungeon! 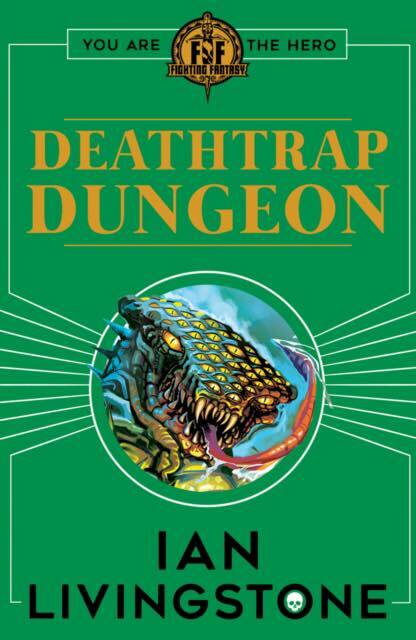 This new self-contained adventure for Advanced Fighting Fantasy 2nd Ed sends the Heroes into this unusual dungeon to stop the rain of undead overwhelming the Allansian town. 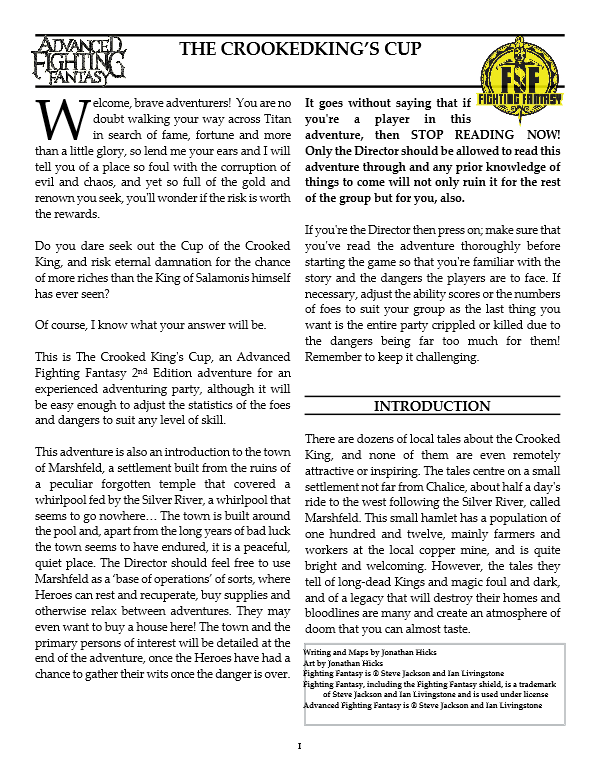 I'm fond of this adventure for two reasons; firstly, I've had an adventure published for the very gaming system and world that got me into tabletop games way back in 1983 (thank you, 'The Citadel of Chaos'! ), and secondly I illustrated it myself, which means I've both written and done the art for Fighting Fantasy which kind of fulfills two dreams of mine. I hope you enjoy this adventure, and be on the lookout for my next one due soon, 'The Inn of Lost Hope'. Note: I hope the above blog post seemed suitably calm and professional. The truth is that I'm so over the top excited that I pretty much leapt out of my skin when I finally saw that the adventure was available and that it was finally out there. It's hard for me to explain how happy this makes me; I know I contributed to the Stellar Advenures game, but this is all my own work and it's set in one of my favourite campaign worlds. Okay. Time to calm down.